Background: Addiction and related disorders are devastating with their tremendous social, psychological, and physical consequences for which development of optimally effective treatments is long overdue. Repetitive Transcranial Magnetic Stimulation (rTMS) is relatively safe and is becoming an emerging therapeutic tool for these conditions. Methods: This systematic review was conducted using PubMed, PsycINFO, PsychiatryOnline and Cochrane Library ranging from year 2001 to 2017. 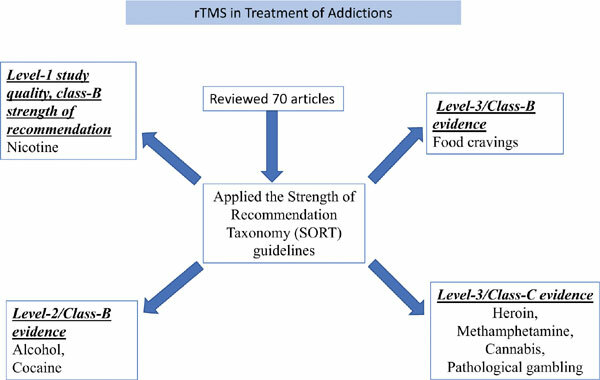 Results: Our search selected 70 related articles of which, based on the Strength of Recommendation Taxonomy (SORT) guidelines, 11 indicated Level-1 study quality and class-B strength of recommendation for rTMS in nicotine addiction (effective in 218/289 subjects who received rTMS as found in 11 studies). Level-2/Class-B evidence was found for alcohol and cocaine addictions (Alcohol: effective in 126/193 subjects who received rTMS as found in 8 studies; Cocaine: effective in 86/128 subjects, as found in 5 studies). For food cravings, Level-3/Class-B evidence was noted (effective in 134/169, found in 7 studies). However, the evidence was limited to Level-3/Class-C for heroin (10/20 subjects received active rTMS, effective in 1 study), methamphetamine (33/48 subjects received active rTMS, effective in 2 studies), cannabis (18/18 subjects received active rTMS, effective in 1 study), and pathological gambling (31/31 subjects received active rTMS, effective in 2 studies). Conclusion: rTMS may serve as an emerging therapeutic option for addiction and related disorders. The major lacunae include important methodological limitations and dearth of knowledge about precise mechanism of action that need to be addressed in the future studies. Drug dependence, rTMS, brain stimulation, pre-frontal cortex, neurobiology, behavioral addiction, drug cravings, addiction treatment.